You’ve probably heard of those pregnant women who find themselves craving odd combinations of foods like dill pickles with peanut butter. Or the ones who squirm at the scent of onions or eggs. And then there are those who strangely crave non-foods, like dirt or chalk. I am none of these women while pregnant. For me, pregnancy only serves to heighten my already existing cravings. I have no food aversions and morning sickness is something I’ve only read about in books. My pregnancy diet is simply my normal diet, in overdrive. Take spicy food for example. I’ve always loved spicy food. This is nothing new. But while pregnant, my desire for spicy food hits new highs. I order my burgers with pepperjack cheese, hot sauce and jalapeños. (Add some extra hot sauce on the side for dipping my fries.) I accidentally forget crucial ingredients for Saturday’s dinner so that I can have my Indian food takeout one night early. I make omelets for lunch so I have something to dip in tabasco. My desire for spicy foods is boundless. So, on a day, which I’d spent baking and decorating dozens of turkey-shaped Lemon-Ginger Sugar Cookies (recipe coming soon), I needed a quick fix for my spicy food obsession. 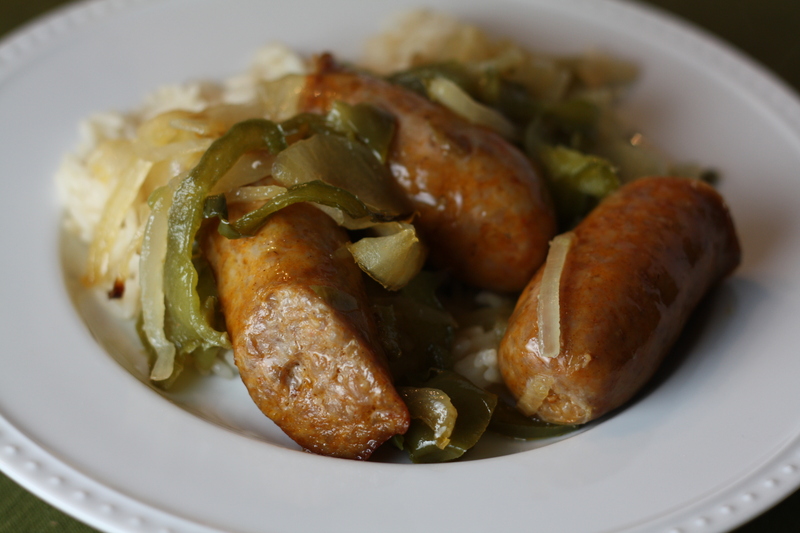 I turned to one of my favorite easy weeknight meals; Roasted Sausage, Peppers, and Onions. This recipe hardly even qualifies as a recipe. It’s just a few simple ingredients joined together in perfect flavor harmony. 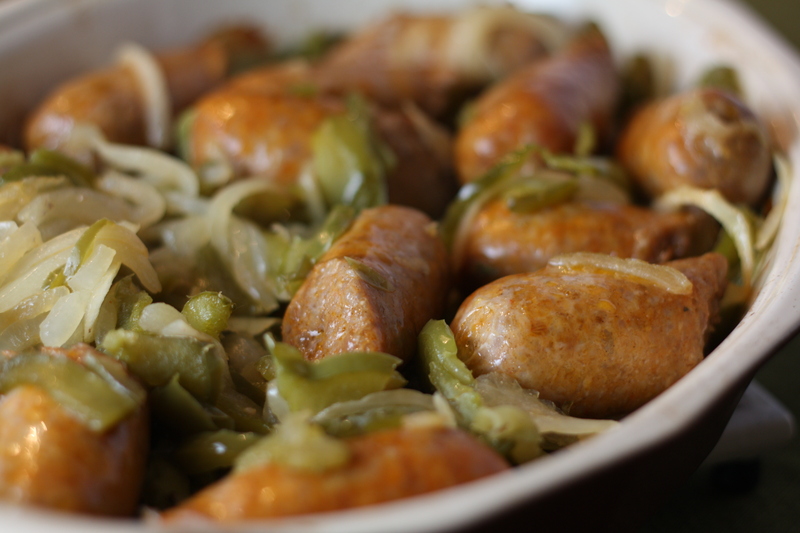 As a child, huge trays of sausage, peppers, and onions were a staple of family party buffets. Served over rice or wrapped in a loaf of Italian bread with provolone cheese, this dish makes a simple, satisfying meal, any night of the week. As you may imagine, I like to prepare this dish using spicy Italian sausages, but sweet Italian sausages work just as well! By cutting the sausages part way through the cooking time, we allow some of the tasty juices to escape in order to mix and mingle with the peppers and onions. The resulting dish simply oozes with delicious Italian flavors. Preheat oven to 375 degrees. Toss the peppers and onions in the olive oil. Place in a baking dish. Arrange sausages on top of the peppers and onions. Cook for 20 minutes. Then, remove the baking dish from the oven, cut the sausages in half and place them back with the peppers and onions. Toss to combine the sausage halves with the peppers and onions. Continue cooking for another 30-40 minutes, occasionally tossing the mixture for even cooking. Serve over rice or create sandwiches on Italian bread with provolone cheese. Posted in Food, Main Course, Pork, Recipes, Vegetable and tagged Cooking, easy dinner, Food, food photography, italian food, pork, Recipes, sausage, vegetables. Bookmark the permalink. I love hot Italian sausage and spicy foods! This is funny because I never liked these foods as a child. Great simple recipe! looks so delicious.. i love spicy foods.. nice post..
Yum, looks amazing! Spicy is my favorite! Amy — this was delicious! But I have to say, 2 tablespoons of olive oil is plenty. My dish was swimming a bit with 3 tablespoons. I served it with risotto! Thanks for the feedback, Kendra! I looked back at the recipe. 3-4 tablespoons does sound like a bit much. I probably just drizzled and estimated. I updated the recipe to lower the range to 2-3 tablespoons, which I’m sure is just enough. I bet it was great with the risotto! I cooked sausage and onions at 375 for 20 min, then turned down to 350 for another 10, sausage was cooked but onions were burned. Was kind of disappointed. Did not use peppers. Sorry you had a bad experience with the dish. Omitting the peppers may have made the difference, since they release liquid as they cook and keep the whole dish moist and delicious. 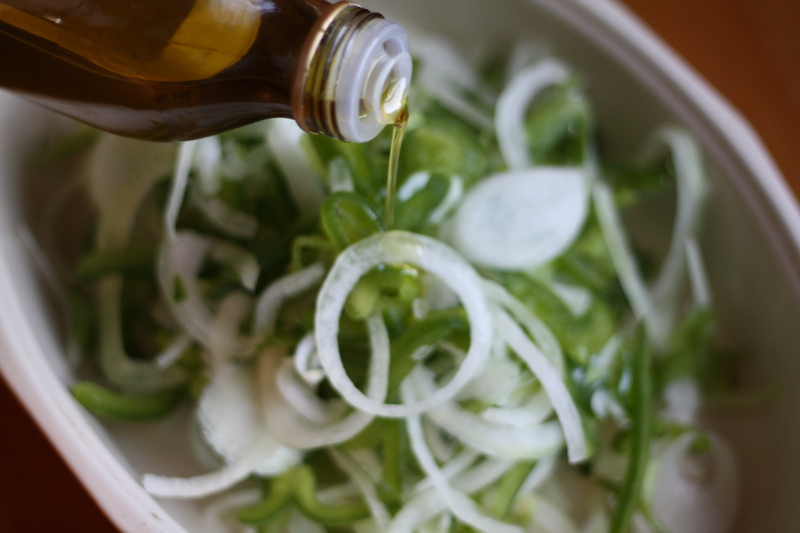 If you decide to make it again without the peppers, perhaps add a bit of liquid, such as additional olive oil, broth, water, or balsamic vinegar, to keep the onions moist and tender. It’s delicious, but floating in oil, after the sausage cooks. I only pricked it. Couldn’t have eliminated the oil beforehand or it would have scorched. Thanks for your comments! I think I’m going to need to rework this recipe a bit. You’re not the first person who’s commented about the dish being too oily, though I’ve never personally had that problem. And another reader recently commented that her dish was too dry. I think a lot of it comes down to variations in the fat content of different grocery stores Italian sausages. I’m going to try to come up with a better way to word the recipe to account for these differences. I made this dish tonight and instead of oil I used a dry white wine. Turned out great. Hi April, I definitely think you could try this with smoked sausage and a bit of beer. There are lots of ways you can play around with it…balsamic vinegar, a touch of wine…have fun with it! Anything that cooks up leaving a too fatty residue can be drained before serving through a wad of paper towels inside a colander and if necessary patted on the top as well.. I do this with everything cooked in oil. I tried this recipe exactly as it is written and it was DeLiCiOuS !!!! Loved it !!!! Wouldn’t change a thing – it was yummmmmmmmy ! I only had 2 peppers (a yellow and an orange) and no onion, but I tried it anyway, using dry spices when I tossed it at the beginning to compensate for the lack of flavour-adding onion. It was superb! Yes, a tad oily at the bottom, but nothing some crusty bread couldn’t solve 😉 Thanks for the recipe! Oh wow! I used Andouille sausage and multi colored peppers. I did make rice for the side, but also warmed some tortillas. This was GONE in a heartbeat! Thank-you! Has anyone tried this with potatoes added? Would they cook properly? This recipe has become a staple in my house. Thank you! Instead of green pepper I use one each of red, yellow, and orange just because I like the flavor better. I’ve learned to simply drain after roasting. Easy enough and helps the cooling process since I’m so eager to dig in as soon as it’s done.